UPDATE: Thanks to the comment by blogger 101 Centavos, I finally asked my local Canadian economist if he could tell me what the number $134 billion means. He says it is not the Canadian government alone that holds this debt, but all Canadian holders both sovereign and private. I am going to try to reach him by telephone for clarification. Meanwhile, in the words of the ever opinionated Emily Latella of Saturday Night fame, “Never mind”. I am thinking about writing a blog for the American Thinker about the announcement that China would spend another 5.4 billion in the Canadian resource sector, this time to buy 5.4 billion of Encana’s natural gas holdings. My view is that China’s purchases of Canadian resources is more about diversifying themselves out of US treasuries. 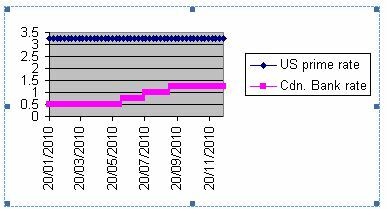 But I found a table updated in November 2010, which shows that the Chinese have actually increased their US treasuries by $265.3 billion since November of 2009 (the chart only goes back that far). Meanwhile, one stat jumped off the page. In that same period, Canada has increased its holdings of US debt by $84 billion! I am shocked. Canadians greatly fear the death of the manufacturing sector. So now they will tolerate this. But I am dismayed and shocked that our government is manipulating the Canadian dollar so that it will not rise against the US. The immorality and the bad management of this situation is beyond words. A couple years ago, I thought that given the bad fiscal policy of the US government would lead to the loonie soaring against the US dollar. But now I see that rather than allow that to happen, the Canadian government is subsidizing the American lifestyle and the American bubble. So that finally explains to me why the loonie remains at par and why price inflation is slow to happen in the US–why price inflation is happening in Canada the same as elsewhere in the world. Not to wear a tinfoil hat (they make my tooth fillings hurt), but is it possible that some of that 84 billion came from currency swaps from the US Federal reserve? Please explain what that means and why it should make me feel better. I also entertained the notion that these were private creditors, but my understanding of the list, however imperfect, is that these are debts owed to foreign governments. Also, even if there was some way to justify the ownership of some US debt, the sudden increase to $134 billion is troubling. What could have caused an $84 billion increase in a twelve month period, except the insane desire to keep the loonie from going higher against the US dollar? I admit being quite surprised and dismayed. I hear all the time about how much US debt is own by the Chinese at 895 billion, that $673 per person; but with Canada’s smaller population base, Canada’s debt ownership of US debt $3961 per person, or nearly six times higher per capita. By GDP, China’s owns .16 US debt/GDP; Canada owns .086 US debt/GDP–so it is half by comparison to GDP; but still, the media doesn’t talk about how much the US owes Canada–I’ve never once heard the media talk about it. So I am sitting in sheer ignorance about why the US owes Canada 134 billion; I also have no idea how to learn how much the US owes Canada in a currency swap. So I would be happy for you to wear a tinfoil hat and disabuse me of my belief in my government’s stupidity and folly. Hi PW, reference to tinfoil hats is just a joke, albeit a lame one. I understand your concern with the folly of governments. 101 – I’ve updated this post with a note at the beginning. I am going to have a conversation tomorrow at 10:00 and see if he knows anything. If this is a currency swap it doesn’t make me feel any better. The Financial Post covered currency swaps in this article: http://www.financialpost.com/news/economy/What+happens+China+dumps+debt/4133420/story.html Still, the author doesn’t even entertain the possibility that Canada is one of these nations. It basically amounts in changing Canadian into US and buying a future to exchange it back into Canadian. In the meantime, an investment such as treasury note is bought. The higher interest rate in second currency then would give a guaranteed “risk-free” rate of return. Canadian interest rates over 2010 remained lower than US interest rates so that this sort of “arbitrage” would be common. So it is possible, as my friend suggests, that Canadian private investors are the owners of the debt; but the Canadian government is not off the hook in that case, because the Bank of Canada has left the interest rates low in order to try to maintain parity with the US dollar. So they are the cause of the depreciation of the loonie, even if they are not the buyers of the debt. I’ll write again after my chat with my economist friend. Centavos: didn’t understand the tinfoil hat reference until I looked it up. Sorry. I misunderstood your question as an objection. I’ll ask my economist friend about currency swaps and if that accounts for any of US treasuries. PW – That’s right – there’s a blurry line between public and private in high finance these days.